I could probably write about my struggles with perfectionism every single day, and never run out of content. Except eventually, I WOULD run out of steam, and then I’d find a way to sabotage myself. That’s what I do. I think that’s what all perfectionists do. We try so hard to do everything the “right” way, we manage to fulfill our own prophecies. Wouldn’t it be AWESOME if we used our perfectionist powers for good? Hole on in the ozone layer? It’s next on my To Do list. Instead, we tell ourselves, “You’re never going finish what you started. You never finish anything.” And guess what? We’re right!!! High five??? Anyone? Bueller? Okay, no one wants to high five me because it’s kind of sad, a little pathetic, and stings with righteous truth. Ouch! Perfectionists like to do things the “right way,” or not at all. The concept of “good enough” makes us feel like we’re cheating. I signed up for Writing 101, because I felt like I needed a crutch. I’d been away from my blog. I was burned out. I needed a starting point, a little reboot. Nothing wrong with that. You injure your foot, nobody expects you to run a marathon. You keep weight off your boo-boo until you don’t need crutches anymore. It’s not something to feel guilty about. But here’s the thing, as soon as I got a writing prompt that I didn’t speak to me, as soon as I got busy with other things in my life, as soon as I missed a post. I felt GUILTY. Because if you’re going to sign up for Writing 101, you need to do it the RIGHT way. Follow the directions. Color inside the lines. Be a good little pen-monkey or don’t bother trying. In the past, this course would have done me more harm than good. Writing 101 isn’t the problem. It’s a crutch, remember? A helping tool. It’s a good thing! The problem is, in the past, I would have turned this tool into a sign of my shortcomings. One more failure to add to my giant failure mountain. You’re probably thinking, “That’s messed up!” And you’re right!!! It is messed up. In the scheme of things, what does it matter if I write one prompt or none of them? I’m not in grade school with the threat of, “This will go on your permanent record,” looming over me. I’m an adult. A grown up. I’ve got bills to pay and everything! If I’m an adult, then why do I treat myself so badly? Why do I set myself up for failure? Why do I give myself unrealistic expectations? Why can’t I forgive myself for being human? Why do I put burdens on myself that I can’t handle? I bully myself inside my own mind. I expect more from myself than I’d ever ask of anyone else. And when I can’t live up to the goals I’ve made, I feel so awful, I don’t want to do anything. I want to run away from my life, to hide inside my work, or a book, or a television show. So what’s the difference between the person I am now and the person I was before? At my core, I’m still the same. For good or bad, that part probably won’t change. I wish I were even-keeled, but my emotions are up and down worse than the weather. Is this normal? I don’t know! I hope it’s not normal, but I’m certainly nor alone in this struggle. There’s a lot of us out there, more that most people seem to realize. Nobody WANTS to admit to feeling guilty about stupid, meaningless stuff. Nobody wants to scream, “I’ve got to work at being happy! Hurrah!” I think some people are better at hiding their I’m-screwed-up-ness than others. I’d wager there are probably more perfectionists out there than you’d imagine. Some are more functional than others. Is there anything that helps? So far, trashing the idea that I need a daily word count has liberated my writing more than anything else I’ve tried. I have a goal of one new sentence per day in my work in progress. That’s it. Last night, I didn’t want to write my own name, let alone work on my novel. But…I could muster up the strength to write ONE sentence. Other days, I’m able to write a LOT more. Do I reward myself for having a good writing day? No. One sentence per day is the goal and I don’t want to give perfectionism a foothold. More writing is nice, but I’m taking baby steps over here, retraining my brain. Time-outs are also helping me. Getting out of the house. Working on creative pursuits that aren’t writing. 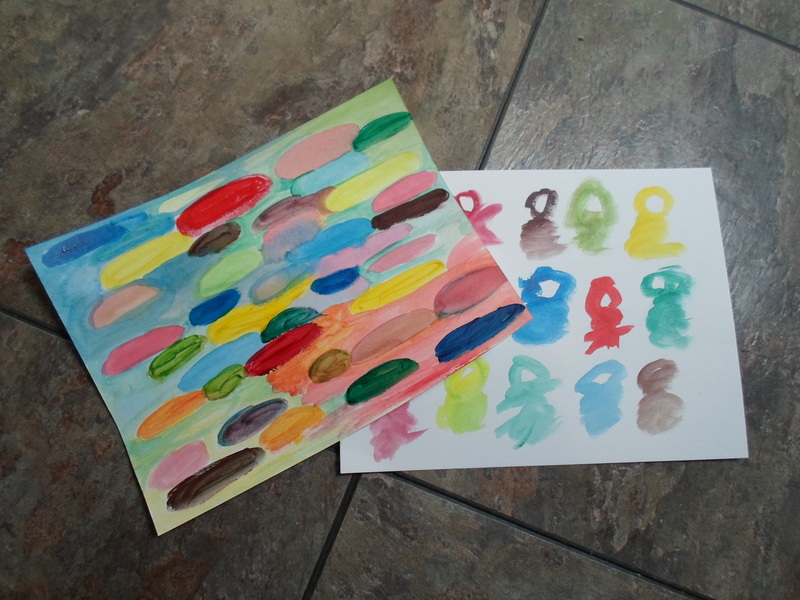 I painted two watercolors this morning. Once they’re fully dry, I’m going to try using a different medium on the same art pieces. A little pen and ink. Another stab at creativity. Previous postSunday Gratitude or Tag! You’re It!!!! Next postOur Name Has Changed!